Losing at least one adult tooth is a very real possibility, whether due to trauma or disease. This can leave you feeling embarrassed, and you may find yourself smiling much less than you used to. But this doesn’t have to be your reality! Here at Park Dental, our team of doctors may use a dental bridge to treat your condition. 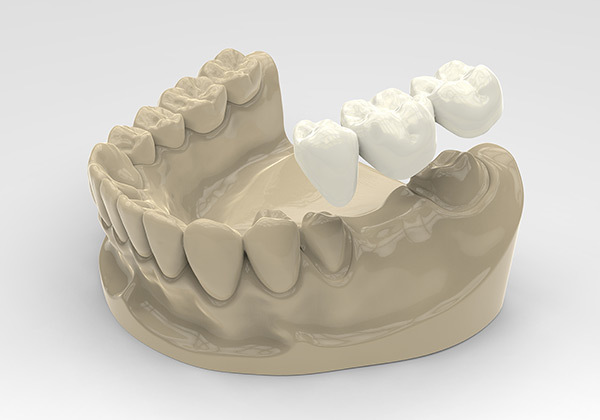 Unlike other restoration types, such as an implant, dental bridges can be completed quickly. Implants may take months to a year to finish depending on your circumstances. But with dental bridges, treatment time is only a couple of weeks to a month maximum. Step 1: Your doctor examines the site of the missing tooth. When putting together your treatment plan, Dr. Hughes, Dr. Mojdami or Dr. Cakmakci takes impressions of your remaining teeth, as well as the empty gap. The support teeth will also be filed down at this point to prepare them for the bridge. Step 2: The data gathered during the consultation is sent to a dental lab, where it is used to create your new, custom dental bridge. Step 3: When the bridge is ready, you will return to our office so that Dr. Hughes, Dr. Mojdami or Dr. Cakmakci can place it. You will then be able to show off your brand new smile! Dental bridges do more than simply fill an empty spot in your smile. They provide new teeth that are fully functional and aesthetically pleasing. These restorations are custom made for each patient so that the end result can perfectly match your remaining natural teeth. The restored confidence that comes from a complete smile can only be beneficial. One other advantage that makes bridges preferable to other restorations that this treatment requires no invasive surgery to complete (though some enamel will need to be removed from the support teeth). Are you suffering from missing teeth and wish to avoid the surgery required for dental implants to succeed? Then a dental bridge may be the tooth restoration treatment that best fits your needs. To find out more, contact our office and schedule a no-obligation consultation with Dr. Andre Hughes today.